For now, let’s rewind to Friday, when I had dinner at Angelica Kitchen. Angelica is one of my favorite vegan restaurants. It’s been around for years, and the food and menu are consistently wholesome, nourishing, and delicious. My fave dishes include the Thai Me Up (a raw carrot and daikon dish), the curried cashew spread, the roast vegetable salad, the hearty combo bowls (wherein you can pair a grain, veggies, sea veggies, and beans in any combination you like), the Dragon bowls (basically a macro bowl) and the pantry plates (wherein you can likewise pair up cold appetizers, spreads, and salads). Angelica’s dips and spreads are pretty memorable, too, and I think the highlight is the restaurant’s walnut and lentil pate. It’s a sweet, salty, and super savory mixture of lentils, walnuts, and spices. I love it so much that I recently created a version of my own. Here’s the recipe. Place the lentils in a medium sized sauce pan. Fill the pan with enough water to submerge the lentils by a few inches. Bring the water to a boil and reduce to a simmer. Simmer for 18-20 minutes, or until the lentils are tender but not watery or mushy (I always check at the 18-minute mark). Drain the lentils and set them aside. Heat a medium sized sautee pan over low heat. Add the walnuts. Toast them, stirring constantly, until they're browning lightly and fragrant. Remove them from heat and set aside. Return the pan to the stove and increase the heat to medium. Add the olive oil and shallots. Cook the shallots for 2 minutes, stirring constantly, and then add the garlic. Cook the garlic and shallots for another 3 minutes, or until everything is soft and fragrant. Add the lentils and combine ingredients well. Remove the pan from heat. Add the walnuts to your food processor, along with the salt. Process until the walnuts form a fine meal. Add the lentil mixture and all other ingredients, along with ⅓-1/2 cup water (as much as you need to get a thick, yet smooth and spreadable consistency, similar to hummus). Process till smooth, stopping occasionally to scrape the bowl down. 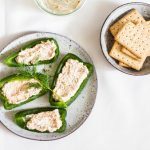 Serve the pate with toast, crackers, or vegetable crudites, or stuff it into a raw collard wrap! Enjoy. Leftover dip will keep in an airtight container in the fridge for up to 5 days. Angelica tops the pate with a wonderful, dill-infused tofu sour cream, which I didn’t make myself when I was making this recipe. But I’m sure that any vegan cream–a cashew cream, maybe, or a tahini dressing–would add a lot of decadence to the dip. I love how rich in protein this dip is, not to mention the rich amounts of Omega-3 fatty acids, courtesy of the walnuts. And I love the savory mixture of vinegar, salt, and miso. This is by far one of my favorite dips so far, and I hope you all get a chance to enjoy it soon. I love using restaurant food for kitchen inspiration, and when the restaurant in question specializes, as Angelica Kitchen does, in precisely the kind of food I love to make, inspiration comes easily. I hope you all had a wonderful holiday, and will be back soon. What a delicious dip! I love lentils and walnuts but I never thought how the combo would taste. Thai Me up at Angelica’s Kitchen is one of my absolute favorite raw dishes. I wish I knew their salad dressing recipe! Looks like you had a fun outing, and I am definitely adding that pate recipe to my queue of recipes to try. What a wonderful day! Recipe looks great. Another must try. Looks like a great time with friends ; ) Love lentils! Do you have any idea how the millet cooked in carrot juice is made? As simple as it sounds?? It strikes my fancy. I love lentils so much but I have never thought of using them as a dip. Great idea. And as Sarah said, the millet cooked in carrot juice sounds delicious! Great pics, what a great day! Hmmm, I have a bag of dried lentils to use up in my pantry that this pate would be perfect for. Thanks! Random question. Should roasted buckwheat groats be soaked before consumption? (I know raw buckwheat groats need soaking which is why I’m curious.) I work at a health food store with awesome bulk bins and when a customer abandons their already bagged goodies, we employees get to snag them for free thanks to health codes. Well, a dear person bagged about 3 pounds of roasted buckwheat last night and I took it home with me. Just wondering what I should do with it now before I throw it in a bowl with some almondmilk… Thanks! Your dip looks delicious! And so does the sunbutter! I’ll have to try this restaurant next time I’m in New York. I LOVE Naturally Nutty’s butters! Have you tried the Pepita Sun Seed Butter? It’s amazing! Nice pics! 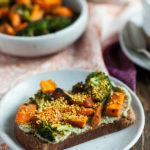 I have a very similar recipe for a lentil-walnut spread that I got from an Andrew Weil book years ago – my kids love it! What a fun weekend! And this dip look delicious– thanks for sharing! Have a great week, Gena! It all sounds so delicious! I would swoon over anything that restaurant had to offer. How’s their cookbook? You beat me to the punch on the food combining question! It did bring up another question though – how strict do you get when it comes to food combining? Is it like an every other day kind of thing, or are there some combos you think are worse that others – like fruit with other food groups or proteins & starches, etc.? Thanks! I’m making this FOR SURE! You know how much I love all things dippy and this looks exceptional! Lentils are one of my favorite things to cook with but I’ve never made them into a dip – what a brilliant idea! I have to say again that you are SO lucky to live in NYC, you have everything you could want right at your fingertips ESPECIALLY delicious restaurants! Ah, Kath and Gena at the same place? And walnut lentil pate. Your pate looks plenty gorgeous to me–are those endive leaves or collards that you served it on? What a fun visit! I’ve been dying to go to Angelica myself, for years. Thanks for bringing a little taste of it here. 🙂 And love the photos–you are too adorable! 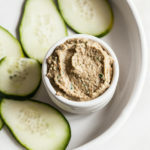 I will be trying your pate soon, and I bet that tofu dill sauce would be pretty easy to recreate too. Looks way too delicious to pass up. Love all the photos too! Love the “holy yum,” haha 😉 And I love seeing two great friends having a blast together! Looks like you too had a great time! And walnut-based pates (raw or cooked) are my fave! You too look so adorable in your photos! Sounds like you guys had a good time; I haven’t explored that many good healthy restaurants in the city. BTW I just read your smoking post; I go to Columbia now. Alas, I never lived in John Jay. Do you know of any really tasty/classic/healthy restaurants up here? I always have so much trouble finding non-greasy college student food, so I usually just end up cooking for myself. Sounds like a great weekend!!! I’ve never been to Angelicas, but I’ve heard lots about it! 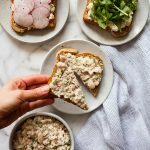 🙂 Your pate looks great and tempeh is my fav soy food too (that I only have on occasion as well!). Love the idea of bring your own juice! And great pics of you! XOXO! Love the photos! You’re too cute. I just tried that sunbutter and it is AMAZING! Everything else looks great too. Just now getting to this post!! That juice combo sounds friggin delicious!!!!!!! I need to get back to NYC! WHOA! Thanks, Steph! I totally forgot to write down the 1 tbsp of nama shoyu that I used in this recipe! It’s definitely meant to be there — I’ve edited accordingly, and thanks for the hawk eye! Thanks for the great recipe! I made this back when you first posted it and loved it. Wondering now whether you could soak the lentils instead of cooking them? Thoughts? Delicious! I added a splash of lemon juice and used fresh parsley and onion because that is what I had on hand. Thank you for sharing.